Organic Raw Unpasteurized Apple Cider Vinegar with Naturally Occurring Mother of Vinegar, Diluted with Water for 5% Acidity. 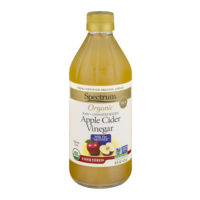 Our Organic Apple Cider Vinegar is made from the pure juice of apples naturally fermented to a honey-colored liquid. It tastes like the fruity tang of crunching into an apple fresh off the tree. Use in pickles of any kind, or to add a dash of acidity to soups and sauces. Shake it up with any of Spectrum Naturals Organic Extra Virgin Olive Oil with a handful of minced herbs for a splendid salad dressing or marinade to braise meat.Hain Celestial.Certified organic by QAI.The "mother" of vinegar - veil-like film found floating in the bottle - is made up of beneficial microorganisms that turn alcohol to vinegar.800.343.7833.www.spectrumorganics.com.2015 The Hain Celestial Group, Inc.
Bumble Bee Solid White Albacore in Water.Premium tuna.Since 1899.Per 56g serving.60 calories.0g sat fat, 0% DV.140mg sodium, 6% DV.0g sugars.See side panel for full nutrition facts.Dr wt 9 oz (255g).